I made this savoury pancake with a sandwich and a chicken fajita on my mind. I came up with a gluten-free, high protein, good carbohydrates version all made in the comfort of my own very small kitchen. 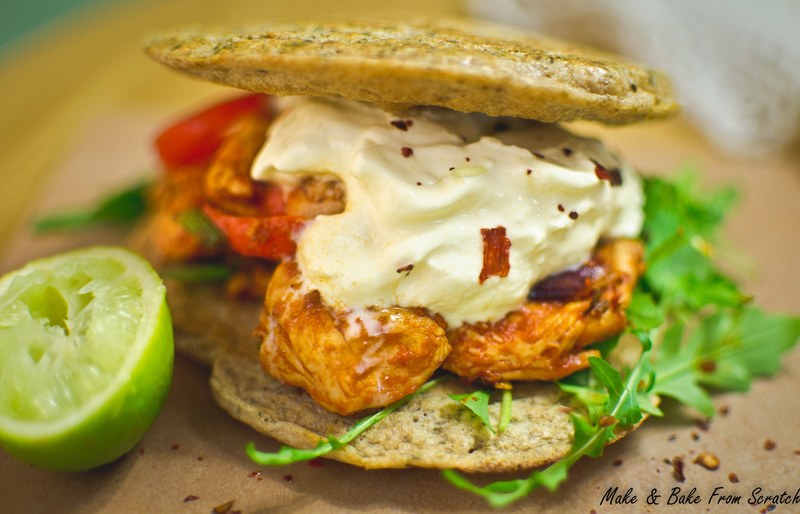 If you like sandwiches and chicken fajita then you will love this. Sure, it is no Ploughman’s sandwich but who cares it’s a better version oozing with flavours of chilli, lime and avocado. Eat this delicious creation for lunch, dinner or tea. Become your own health chef and turn your kitchen into a creative cooking hub. I found spare tiles on the balcony; I washed two and made plates out of them. Be inspired. Savoury Pancakes: pop all ingredients in a food processor blitz until combined. Use a small pan (I used 16cm). Melt ½ tsp. coconut on medium heat, pour half the pancake mixture on, cook on each side for 4 minutes (should be light brown), pour the next half of the pancake mixture. This will make a top and bottom sandwich effect. Spicy Tomato Chicken: Melt 1 tsp. coconut oil on a large pan medium heat, add spices and chicken. Next add chopped red pepper, spring onion and tomato paste. Ensure chicken is cooked in the middle (no pink bits) before serving. Squeeze lime juice over the chicken and remove from heat. Homemade Guacamole: Scoop avocado pulp, lime juice and pink salt into a food processor and blitz until combined. Plate it up as you would a sandwich. I added rocket, dolloped crème fraiche (1 tsp.) on top and chilli flakes.